Aim: The aim of this study was to describe our institutional experience, primarily with general anesthesiologists consulting with cardiac anesthesiologists, caring for left ventricular assist device (LVAD) patients undergoing noncardiac surgery. Materials and Methods: This is a retrospective review of the population of patients with LVADs at a single institution undergoing noncardiac procedures between 2009 and 2014. Demographic, perioperative, and procedural data collected included the type of procedure performed, anesthetic technique, vasopressor requirements, invasive monitors used, anesthesia provider type, blood product management, need for postoperative intubation, postoperative disposition and length of stay, and perioperative complications including mortality. Statistical Analysis: Descriptive statistics for categorical variables are presented as frequency distributions and percentages. Continuous variables are expressed as mean ± standard deviation and range when applicable. Results: During the study, 31 patients with LVADs underwent a total of 74 procedures. Each patient underwent an average of 2.4 procedures. Of the total number of procedures, 48 (65%) were upper or lower endoscopies. Considering all procedures, 81% were performed under monitored anesthesia care (MAC). Perioperative care was provided by faculty outside of the division of cardiac anesthesia in 62% of procedures. Invasive blood pressure monitoring was used in 27 (36%) procedures, and a central line, peripherally inserted central catheter or midline was in place preoperatively and used intraoperatively for 38 (51%) procedures. Vasopressors were not required in the majority (65; 88%) of procedures. There was one inhospital mortality secondary to multiorgan failure; 97% of patients survived to discharge after their procedure. Conclusion: At our institution, LVAD patients undergoing noncardiac procedures most frequently require endoscopy. These procedures can frequently be done safely under MAC, with or without consultation by a cardiac anesthesiologist. To describe our institutional experience handling the care of LVAD patients undergoing noncardiac surgery, with an emphasis on guidance and management strategies for noncardiac anesthesiologists caring for this population. We suggest that noncardiac anesthesiologists can safely care for these patients by adhering to the fundamentals of preoperative, intraoperative, and postoperative anesthetic care. Left ventricular assist devices (LVADs) are advanced mechanical therapy for end-stage heart failure, placed in patients to improve symptoms and survival. Since 2006, over 12,000 patients have received one of these devices, with over 2500 implanted in 2013 alone. LVADs are most commonly implanted as a bridge to transplantation (BTT) with the patient eligible for heart transplantation listing following device placement. They can also be used as destination therapy (DT) allowing patients to live the rest of their lives with the device in place. A smaller number of patients have the device placed as a bridge to eligibility, for future assessment of transplant candidacy based on the recovery of organ system function following ventricular assist device (VAD) placement, and in a minority of patients as a bridge to recovery. These devices have been in clinical use since 1994 when the first generation, volume displacement, pulsatile HeartMate XVE device received the Food and Drug Administration (FDA) approval. Since then, the technology has continued to evolve and the current second and third generation devices are significantly different from the initial technology. In 2008, the FDA approved the HeartMate II device (Thoratec, Pleasanton, CA, USA) as the first of the second generation continuous flow VADs approved for BTT, with subsequent approval for DT in 2010. In 2012, the HeartWare HVAD device (HeartWare International Inc., Framingham, MA, USA) received the FDA approval for BTT. This third generation device differs from the HeartMate II in that it has a noncontact bearing design that utilizes magnetic levitation and hydrodynamic suspension. Readers are referred to Nguyen and Thourani  and other references for a detailed review of device technology. The patients with LVADs commonly have significant coexisting disease. This may include right ventricular failure, atrial or ventricular arrhythmias, renal insufficiency, liver dysfunction, gastrointestinal (GI) bleeding, and diabetes. In the weeks, months, and years following device implantation, these patients may require noncardiac surgery for these and other comorbidities. In fact, inpatient hospital readmission rates within 6 months of device implantation have been reported to be as high as 50%, with an overall admission rate of between 1.6 and 2.5 admissions/patient year post-VAD implantation. GI bleeding rates in LVAD patients have reached an incidence of 30%. Many LVAD recipients develop GI arteriovenous malformations and/or acquired Von Willebrand disease which, in the setting of nonpulsatile flow VADs and full-dose anticoagulation, can greatly increase their risk for bleeding  and require intervention in the form of upper and lower endoscopies. Given the complexity of their cardiac disease and comorbidities, attempts are usually made to admit these patients to identified “VAD referral centers,” but these centers may not always be in proximity when the need for medical attention arises, and emergency procedures for patients with VADs may occur at nonreferral centers, by physicians without extensive experience dealing with this population. Safe and appropriate management of this patient population requires careful planning and attention to detail due to the complex interaction of the LVAD with the patient's native cardiopulmonary circulation, the severity of their underlying heart disease and comorbidities, and the need for anticoagulation required to prevent pump thrombosis. Here, we present an analysis of the perioperative management of patients with LVADs undergoing any type of procedure at a tertiary referral center with an active VAD and transplant program. Our objective is to describe our institutional experience managing noncardiac surgery in patients with LVADs, emphasizing key points to consider when care is provided by a noncardiac anesthesiologist. After the Institutional Review Board approval, the medical record database was searched for patients with LVADs undergoing any noncardiac procedure between January 2009 and March 2014. The patients were included if they had previously implanted LVADs and were over 18 years of age. Procedures during the index hospitalization for LVAD placement were included. Exclusion criteria were age <18 years and subsequent cancellation of noncardiac surgery. 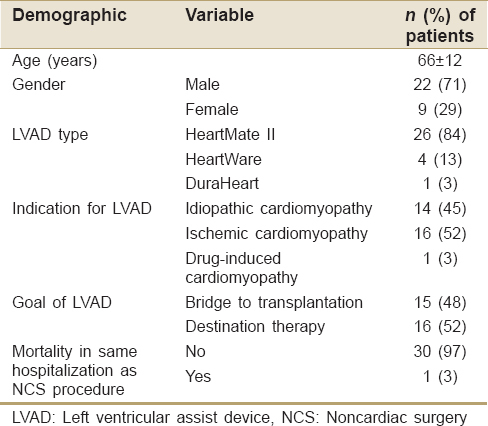 Demographic and preoperative data collected, shown in [Table 1], included age, gender, type of LVAD, primary indication, and goal of VAD. Procedural data [Table 2] collected included the type of noncardiac surgery performed, anesthetic technique, vasopressor requirements, invasive monitors used, whether primary anesthesia provider was in the cardiac anesthesia division, blood product management, need for postoperative intubation, postoperative disposition and length of stay, and perioperative complications including mortality. Perioperative mortality was defined as death within 30 days of procedure. Descriptive statistics for categorical variables are presented as frequency distributions and percentages. Continuous variables are expressed as mean ± standard deviation and range when applicable. Statistical analysis was completed using the software program, SAS version 9.3 (SAS Institute, Cary, NC). During the study, 31 patients with LVADs underwent a total of 74 noncardiac procedures. Seventy-one percent of patients were male, and 84% had the HeartMate II LVAD device implanted. No patients had temporary or permanent right VAD support in place. Forty-eight percent (15) of the patients had the device placed for BTT, and 52% as DT. The indication for LVAD placement was idiopathic cardiomyopathy (14 patients, 45%), ischemic cardiomyopathy (16 patients, 52%), and drug-induced cardiomyopathy (1 patient after chemotherapy). There were no intraoperative complications recorded; however, postoperative complications were seen following 17 of 74 procedures (23%). There was one mortality during the same hospitalization as the noncardiac surgery due to multiorgan failure; 97% of patients survived to discharge after the procedures. Each patient underwent an average of 2.39 ± 1.48 procedures (range 1–6). Of the total number of procedures, 48 (65%) were upper or lower endoscopies. Another 13 were driveline debridements, and the remaining were a mix of general surgical, urological, and vascular procedures. One patient required an endometrial ablation, and one underwent burr-hole evacuation of a subdural hematoma. Most of the procedures (70, 95%) were booked as an elective or nonemergent procedure. Regarding perioperative anesthetic management, 81% of procedures were completed under monitored anesthetic care (MAC). One cystoscopy was performed, without complications, under neuraxial anesthesia. This was coordinated with the VAD team to assist with the planning of perioperative heparin infusion cessation and recommencement. The remaining 13 procedures (18% of total) were completed under general endotracheal anesthesia. Postoperative intubation was required after only 2 (3%) procedures, with 55% of patients admitted to the Intensive Care Unit (ICU) for postoperative monitoring. The average length of stay postprocedure was 15 days, with a range of 0–129 days. Perioperative anesthetic care was provided by faculty within the division of cardiac anesthesia in 38% (28) of procedures. Invasive blood pressure monitoring was used for 27 (36% of) procedures, with a central line available for use in 6 (8% of) procedures, a peripherally inserted central catheter (PICC) line available for use in 26 (35% of) procedures and a midline available for use in 6 (8% of) procedures. All of these venous access devices were in place before the surgery began. Only one procedure required intraoperative transesophageal echocardiography (TEE) use. Throughout the hospital stay, blood products were required in 62% of procedures, the majority of which was autologous red blood cell transfusion (RBCs in 30 procedures, 41%). Eleven percent (8) of procedures required RBC as well as plasma (fresh frozen plasma [FFP]) transfusion, 5% (4) required packed red blood cells (PRBCs), FFP, and platelet transfusion, and 4% (3) required PRBCs, FFP, platelets as well as cryoprecipitate. One patient received plasma only. Intraoperative and day of transfusion rates were much lower at only 19 procedures of 74 (26%) requiring blood product transfusions. Of these same-day transfusions, 37% were PRBC only, 53% were FFP only, 5% were a mix of both PRBCs and FFP, and the remaining 5% received PRBC, FFP, and platelets. It should be emphasized that the majority of patients (33 of 46, or 72%) receiving perioperative blood transfusions was those undergoing endoscopic procedures, likely the reason for their admission and unrelated to the procedure itself. Vasopressors were not required in 88% (65) of procedures. One patient had preoperative inotropic support (epinephrine, dobutamine, and milrinone) which was continued at baseline infusion rates during the procedure. During the 9 procedures requiring vasopressors, boluses of phenylephrine were predominantly used (accumulated dose range 100–1200 mcg), and one patient received a single bolus of norepinephrine 4 mcg. There have been several descriptive studies of the perioperative management of an LVAD patient population undergoing noncardiac surgery, the largest of which was published by Stone et al. in late 2015 which recounts 291 procedures on 138 LVAD patients. Our study demonstrates a single institutional LVAD patient population including all forms of noncardiac procedures under any form of anesthetic. Our goal is to describe our institutional experience handling the care of these patients, with an emphasis on guidance and management strategies for noncardiac anesthesiologists caring for this population. Noncardiac procedures were required in approximately half of the total number of LVAD patients known to our institution during the study (31 of 68 patients, 46%). This number is higher than the values reported by other research which ranges from 4% to 33%, but averages at 22%. At our institution, LVAD patients undergoing noncardiac procedures most frequently require upper or lower endoscopies, and these procedures can be done safely under MAC anesthesia, with or without the support of a cardiac anesthesiologist. Our institution is a tertiary referral center with an active VAD and transplant program, allowing us the resources to utilize cardiac anesthesiologists to handle care in 28 of the 74 cases. However, it is clear that noncardiac anesthesiologists may safely manage these patients, supporting the findings of Stone et al. Of our 74 procedures examined, 46 were undertaken by noncardiac anesthesia providers. There were no adverse outcomes in any of these 46 cases. In addition, 81% of our cases were performed as MAC cases, which at our institution are often completed at the bedside for patients admitted to the ICU. We found that the most common medications utilized during these MAC cases were based on attending preference and often included similar combinations as used on many of our non-VAD patients – a mixture of midazolam, fentanyl, propofol, dexmedetomidine, and meperidine. We found 19% of attendings utilized a combination of midazolam and meperidine; 19% midazolam and fentanyl; 14% midazolam, fentanyl, and propofol; 11% midazolam and propofol; and 11% propofol alone. The rest included the use of midazolam alone versus combined either with dexmedetomidine, ketamine, or etomidate. The average amount of midazolam administered during MAC cases when in combination with other medications was 3 mg. None of the MAC cases required intubation or conversion to general anesthesia. Of note, one patient underwent neuraxial anesthesia for cystoscopy in the setting of severe bladder spasms and hematuria with retained clots. This patient had been off of all anticoagulation, with the exception of aspirin 325 mg daily, for 48 h before the procedure due to excessive hematuria. His prothrombin time/partial thromboplastin time and International Normalized Ratio were all within normal limits before spinal placement. Hyperbaric 0.75% spinal bupivacaine was utilized for spinal, along with 2 mg midazolam and 50 mcg fentanyl for intraoperative anxiolysis. A heparin drip was recommenced per surgeon's request postoperatively. No postoperative complications were noted in this patient. Eighty-four percent of our patients presented for noncardiac surgery with a HeartMate II device, a second generation continuous axial flow device. These devices depend on preload in addition to native myocardial function and device output. In regard to selecting monitoring devices, common perceptions regarding the tracking of blood pressure in LVAD patients include the need for Doppler ultrasound and manual blood pressure measurements. However, contrary to the suggestion that the LVAD population requires invasive hemodynamic monitoring in the form of arterial lines, central venous access, pulmonary artery catheters, and TEE,, we feel that in most cases, the standard American Society of Anesthesiologists monitors with noninvasive blood pressure cuffs are adequate. The majority of the procedures analyzed here did not require invasive blood pressure monitoring. Importantly, our institutional practice is to use noninvasive blood pressure cuffs (not manual Doppler-assisted measurements) for perioperative blood pressure monitoring, and if there is inadequate pulsatility to provide a reliable measurement, to place a peripheral arterial catheter. Of the 27 (36%) patients requiring arterial line placement, 11 underwent endoscopy procedures while the rest underwent more invasive procedures including laparotomy, laparoscopy, thrombectomy, subdural hematoma evacuation, endometrial ablation, and urological procedures including TURP. Ten (77%) of the 13 patients undergoing general anesthesia had arterial lines placed. This suggests that the majority of LVAD patients had an adequate noninvasive blood pressure recording, and most patients who required arterial catheter placement received it for indications commonly considered in the non-LVAD population – that is, the need for frequent blood gas analysis, anticipated hemodynamic instability related to the procedure, or significant risk of blood loss. We advocate that it is reasonable to forgo invasive blood pressure monitoring in patients undergoing endoscopy under MAC; however, in those undergoing general endotracheal anesthesia (GETA), the placement of an arterial line is acceptable. TEE was used rarely, in only one patient undergoing complex cystoscopy with ureteroscopy and stent placements, requiring general anesthesia and blood transfusion. Central venous catheters and PICC lines were available for use in 43% of our cases with midlines available for use in another 8% of our cases; however, all were in place before the surgery for drug infusion and volume resuscitation in the ICU. No pulmonary artery catheters were inserted for cardiac output measurement. Interestingly, the majority of our patients with LVADs undergoing noncardiac procedures did not require any vasopressor support, and in those who did, phenylephrine was the preferred medication used for boluses. Cardiac output in these patients is often dependent on adequate preload and the function of the right heart. In a preload dependent state, the use of phenylephrine allows for an increase in systemic vascular tone and a rise in mean arterial pressure and cardiac output  while the LVAD pump speed can remain constant. Perioperative blood products were transfused in 62% of our patient population with PRBCs alone required in 41%. This number is high, but similar to what has been reported in other studies. Of all patients who received perioperative blood transfusions, the majority - 33 of 46 procedures (72%) - was patients undergoing endoscopic procedures, indicating that transfusion was likely necessary due to intractable GI bleeding related to underlying pathology and likely the reason for admission in the first place as opposed to the procedure itself causing bleeding. Intraoperative and day of transfusions were much lower at only 27%, with the majority (53%) of these patients receiving FFP for anticoagulation reversal. Providers should always be ready preoperatively with adequate blood product allocation; however, in many cases, procedure-related transfusion will not be necessary. There were no intraoperative complications recorded; however, postoperative complications were seen following 17 of 74 procedures (23%). There was one death due to multiorgan failure, 2 weeks following a bronchoscopy performed under MAC during the same hospital stay. The postoperative complications included most commonly arrhythmia seen after 6 (35%) of the procedures – ranging from ventricular tachycardia and ventricular fibrillation to atrial flutter. Acute kidney injury was seen after 3 (18%) procedures, electrolyte imbalances after 2 (12%) procedures, anemia after 2 (12%) procedures, and neuropathy, pleural effusion, heparin-induced thrombocytopenia, and Clostridium difficile infection were each seen once postoperatively. Accordingly, our 30-day mortality rate was only 1.4%, much lower than the 6.4–16.7% described by Davis et al. in their systemic review of perioperative morbidity/mortality in this patient population. The limitations to our study include its retrospective nature and sample size of only 74 post-VAD, noncardiac procedures. In addition, our anesthesia records do not currently record LVAD-related parameters for analysis including pump index, pump speed, and pump power which may be useful to the anesthesiologist managing these cases. Despite these confines, the findings of this analysis are significant for a number of reasons, but most importantly - for anesthesiologists practicing outside of tertiary referral or VAD-program centers, this shows that perioperative care for patients with LVADs can be undertaken safely with appropriately selected monitoring for the majority of noncardiac procedures. These patients are more likely than the general population to require peripheral arterial catheter placement for blood pressure monitoring; however, this is not universally required and often LVAD patients have reliable blood pressure measurements made with standard noninvasive blood pressure cuffs. These patients most frequently present for upper or lower endoscopies, which can be safely done under MAC, and typically do not require any more complex vasopressor management than intermittent phenylephrine boluses. Consultation with a cardiac anesthesiologist is suggested when any uncertainly or clinical question arises. Heart failure affects over 5.6 million Americans today, and with exponential increases (over 8 million) expected by 2030, LVAD patients will continue to fill our operating rooms and ICUs. With improved devices and longer survival, these patients require more postimplantation, noncardiac surgery. We suggest that noncardiac anesthesiologists can safely care for these patients by adhering to the fundamentals of preoperative, intraoperative, and postoperative anesthetic care. We had no intraoperative complications, no device-related morbidity, and a 30-day mortality rate of only one patient in 31 over our study period of 5 years. A thorough preoperative evaluation assessing anticoagulation status, medications, and end-organ dysfunction; attention to the basic principles of avoiding aspiration and assuring adequate intravenous access; and judicious maintenance of preload with an understanding of basic LVAD physiology will pave the way for a secure perioperative experience. Patel S, Nicholson L, Cassidy CJ, Wong KY. Left ventricular assist device: A bridge to transplant or destination therapy? Postgrad Med J 2016;92:271-81. Nguyen DQ, Thourani VH. Third-generation continuous flow left ventricular assist devices. Innovations (Phila) 2010;5:250-8. Sheu R, Joshi B, High K, Thinh Pham D, Ferreira R, Cobey F. Perioperative management of patients with left ventricular assist devices undergoing noncardiac procedures: A survey of current practices. J Cardiothorac Vasc Anesth 2015;29:17-26. Cushing K, Kushnir V. Gastrointestinal bleeding following LVAD placement from top to bottom. Dig Dis Sci 2016;61:1440-7. Islam S, Cevik C, Madonna R, Frandah W, Islam E, Islam S, et al. Left ventricular assist devices and gastrointestinal bleeding: A narrative review of case reports and case series. Clin Cardiol 2013;36:190-200. Loforte A, Montalto A, Ranocchi F, Casali G, Luzi G, Monica PL, et al. Heartmate II axial-flow left ventricular assist system: Management, clinical review and personal experience. J Cardiovasc Med (Hagerstown) 2009;10:765-71. Sayer G, Naka Y, Jorde UP. Ventricular assist device therapy. Cardiovasc Ther 2009;27:140-50. Cannesson M, Jian Z, Chen G, Vu TQ, Hatib F. Effects of phenylephrine on cardiac output and venous return depend on the position of the heart on the Frank-Starling relationship. J Appl Physiol (1985) 2012;113:281-9. Writing Group Members, Mozaffarian D, Benjamin EJ, Go AS, Arnett DK, Blaha MJ, et al. Heart disease and stroke statistics – 2016 update: A report from the American Heart Association. Circulation 2016;133:e38-360.